The Himachal Pradesh Govt. 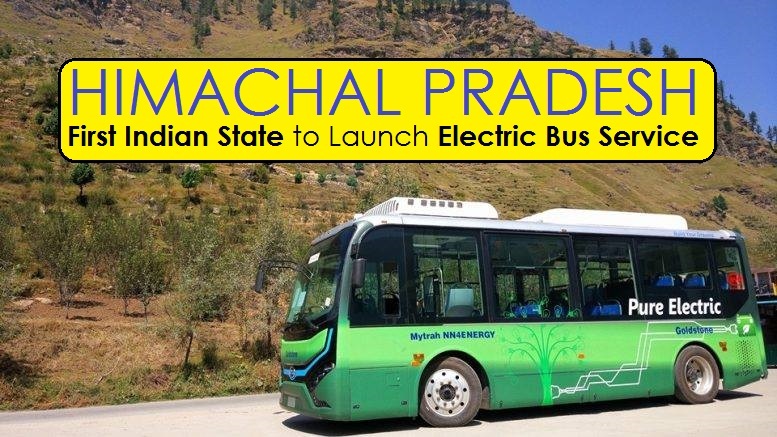 has launched the first electric bus service on 51km ecologically fragile between Manali and Rohtang Pass. Now, the HP state has become the first in the world to ply electric buses at an altitude of 13 thousand feet. The move was made amidst concern over increasing environmental degradation in the Rohtang Pass area due to plying of diesel taxis. Each electric bus has a capacity to carry 30 passengers and can cover 200 km with the fully charged batteries. The fare is yet to be fixed but it would be marginally higher than diesel buses. The Board of National Payments Corporation of India (NPCI) has appointment ‘B Sambamurthy’ as the interim Chairman of the Board. He will replace M Balachandran. Earlier, Sambamurthy was formerly Director and CEO of Institute for Development and Research in Banking Technology (IDRBT) & also CMD of Corporation Bank. National Payments Corporation of India (NPCI) is the umbrella organisation for all retail payment systems in India, aims to allow Indian citizens to have unrestricted access to ‘e-payment’ services. The organization is owned by a consortium of major banks and has been promoted by the country’s central bank, the Reserve Bank of India (RBI). The Union Minister of State ‘Dr. Mahesh Sharma’ has released the book titled ‘Bhartiya Kala Mein Salil Kridayen Evam Sadyahsnata Nayika’ at a function in National Museum. This book authored by Dr. Kshetrapal Gangwar & Shri Sanjib Kumar Singh, based on original research, written to highlight the Indian Art. The literary sources and archaeological evidence proves that it was a dear subject for the artist and Literary persons. The Ministry of Environment, Forest, and Climate Change will hold a quiz on environment ‘Prakriti Khoj’ throughout the country. The quiz is planned in five rounds, the qualifying round (first round) will begin on 25th Sep and continue till 29th of this month. The second round (30th October to 3rd of November), the third round (20th to 24 of November) while the fourth round (4th to 6th of December) and fifth round (18th to 20th December). The quiz will be conducted online through multiple-choice questions. The Union Textiles Minister Smriti Irani and Rajasthan Chief Minister Vasundhara Raje inaugurated the 6th edition of the four-day international textile and apparel fair, 'VASTRA 2017' in Jaipur, Rajasthan. More than 50 countries and 13 Indian States are participating in VASTRA 2017. VASTRA 2017 is an all-encompassing trade fair and conference on Textiles and Apparel presenting a fusion of the finest and the latest in textiles products. Note: The event is jointly organized by Rajasthan State Industrial Development and Investments Corporation Limited (RIICO) and Federation of Indian Chamber of Commerce and Industry and is supported by the Government of Rajasthan. Scientists have created the world's first 'molecular robot' that can be used to build molecules and may help discover novel drugs. The tiny robots developed by researchers at the University of Manchester in the UK can be programmed to move and build molecular cargo using a tiny robotic arm. Each individual robot is capable of manipulating a single molecule and is made up of just 150 carbon, hydrogen, oxygen and nitrogen atoms. Note: In the future, such robots could be used for medical purposes, advanced manufacturing processes and even building molecular factories and assembly lines. Former World Middleweight Champion and stand-up comedian Jake LaMotta (95-years) passed away in Miami. Fighting mostly as a middleweight and known as the "Raging Bull" and "Bronx Bull," LaMotta finished his 13-year career with 83 victories (30 by knockout), 19 losses and four draws. French businesswoman, world's richest woman 'Liliane Bettencourt' (94-years) passed away in Paris. In 2016, Bettencourt was ranked as the richest woman in the world with a fortune of USD 39.5bn by Forbes magazine. Bettencourt was the only child of Louise Madelaine Berthe and Eugene Schueller (founded L’Oreal). She inherited L'Oreal group empire when her father died in 1957. Fino Payments Bank has launched its mobile banking app ‘BPay’ to make banking easy for millions of underbanked people in India. The mobile banking app enables simple, paperless, and convenient banking that allows customers to make bill payments, recharges, fund transfers and buy insurance. ‘BPay’ allows customers to seamlessly access wallet as well as the savings account, with a single login and interface. Note: Fino started its banking operations in July with 410 branches and 25,000 access points. Indian shuttler PV Sindhu jumped two places to World No 2 (second time in her career) in the latest Badminton World Federation women's singles rankings. She last reached her best ranking following her win at the India Open Super Series back in April,2017. Chinese Taipei's Tai Tzu Ying retained her top spot and Saina Nehwal at the 12th spot. In the men's singles rankings, K Srikanth remained unchanged at eighth while B Sai Praneeth and H S Prannoy dropped one place each to be at 17th and 19th positions.